A key architect of the Marine’s future fight in an era of great power competition was tapped Tuesday to be the next commandant of the Marine Corps, according to a Congressional notification. Lt. Gen. David Berger, the current commander of Marine Corps Combat Development Command, is a career infantry officer with extensive Middle East and Western Pacific experience. The nomination was first reported by Military.com. 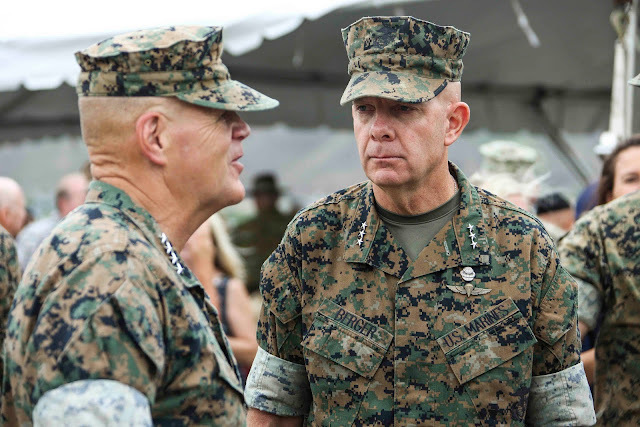 Since taking over command of MCCDC in August, Berger has been refining Marine Corps’ emerging operational ideas, like the Expeditionary Advance Base Operations and Littoral Operations in a Contested Environment concepts, that hope to guide the service in future high-end conflict. In his role, he has also pushed a modernization agenda for the Marine Corps. “We can’t do the incremental change – we have to find new ways to operate, not just new ways of using the gear we have,” he said in September. Prior to his current assignment, Berger had led I Marine Expeditionary Force in California and U.S. Marine Corps Forces, Pacific since 2014. In 2012 he took command in Afghanistan as the commander of the 1st Marine Division in support of Operation Enduring Freedom. Then-Col. Berger also served in Iraq as the leader of Regimental Combat Team 8 in Fallujah. If confirmed by the Senate, Berger will replace Gen. Robert Neller who has served as the Marine Corps commandant since 2015. Why do change agents fail at their task? 1. Too much change too fast. 2. They fail to get buy in from the rank and file. 3. They don't allow time for the change that they're seeking to become implemented before they push for even more change. 4. They arrogantly assume that proposal is implementation instead of actually seeing the change they desire take root. The Marine Corps needs a beat to reorient to the threats of the future. The social change has been overwhelming and has not had time to settle throughout the force. Additionally pressures of constant training routine, crushing ops tempo, never ending wars and other things have caused unnecessary friction from inside while other dynamics are causing even more friction from outside. In other words I hope this guys serves as a stabilizing influence instead of another in a series of change agents.